Holy cow friends, this is one delicious recipe. I have had this one for a while, just waiting for semi fall like weather to get here. I needed to get my recipes turned into my editor for my Red River Moms column and since we are working on the November issue, I figured it was a perfect time to try it to test it out for my column. Well I was not disappointed. So. dang. good. While it is cooking, it makes the whole house smell so inviting and tastes like Fall in a mug. It is a copy cat Starbucks ecipe that I came across on Pinterest and I thought it sounded yummy. I have never ordered it at Starbucks and actually just noticed it for the first time on the menu the other day. First sip and I was hooked!! It warms in the crock pot making it fuss free to boot!! You will need a small crock pot for this. I used my 4.5 quart and it was a little too big. It still worked fine though so if that is what you have you can use it and if you are making it for Halloween night or for guests arriving on a (hopefully) chilly Thanksgiving morning, this could and should be doubled and the 4.5 quart size would actually be perfect. In a 2 quart slow cooker, combine all ingredients except whipped cream. Whisk all ingredients together until good and combined. “Cook” on low for around 4 hours. 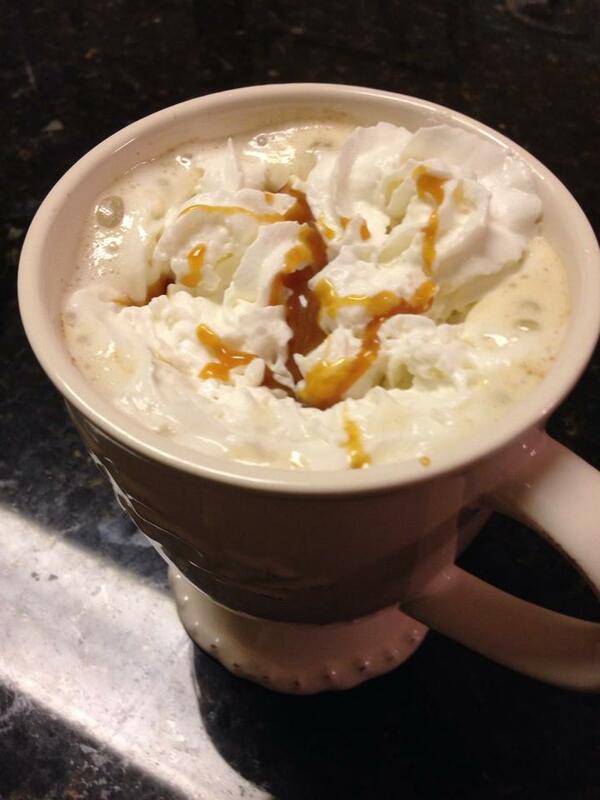 Ladle into mugs and top with a good dollop of whipped cream and drizzle a little caramel syrup on top for good measure. Now…call me crazy…but next time I am going to sprinkle a little fleur de sel (flaky salt) on top. Because I am a sucker for salted caramel anything. Fall in a mug my friends!! !